In July Fabio had a couple more conferences, both in China. Jonathan and I again decided to invite ourselves because, after all, one free ticket a vacation makes! The conferences were a week apart, so we filled in the middle with more China fun and came home having made some amazing memories together. 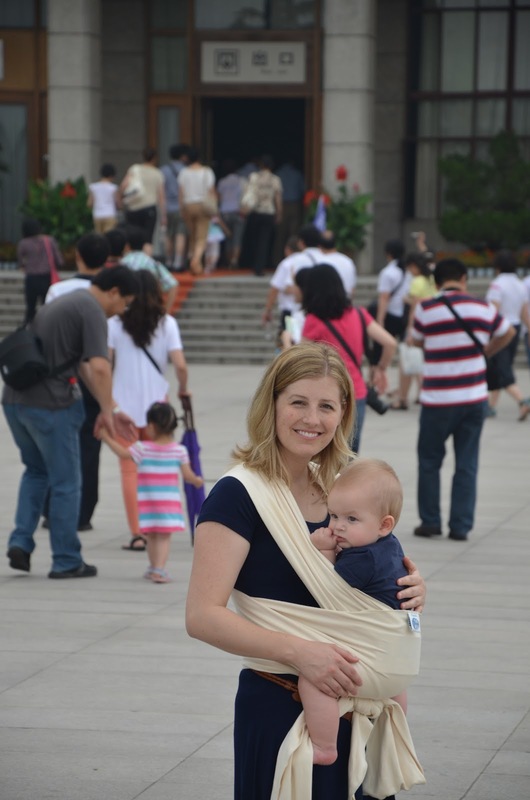 We started in Xi'an, China's ancient capital and home of the Terra cotta warriors. Michael Yang, our guide, could not have been better. He made the whole experience more meaningful by teaching us about the culture, the history, the language, and the food. It felt more like a friend was taking us around than a tour guide. Look him up if you go to Xi'an. The history part. Xi'an's city center is still surrounded by the ancient wall built by an emperor over a thousand years ago, improved and reinforced until 1400 AD. Impressive is an understatement. The top is 10 meters wide, leaving plenty of room for a tandem bike ride. And, in a moment of spontaneous irresponsibility (Fabio seems to bring these out in me...) we strapped J to Fabio and did just that! It turned out to be the perfect way to see the city and to stop at our leisure to enjoy different views. We didn't bike the entire 14 kilometer square, but I'd say we got our $6 USD worth. Fabio and I were really surprised by how much we enjoyed the museums in Xi'an, since we're not particularly "museum people." Our favorite was the stone tablet museum, filled with tablets as ancient as 2,300 years engraved with spiritual texts, eulogies, and poetry. Our favorite tablet was a poem engraved around a depiction of a bamboo stem in such a way that the characters looked like the bamboo leaves. Perfectly beautiful. Unfortunately, I left my camera battery in the hotel so we had to keep all of our memories in our minds for that one. 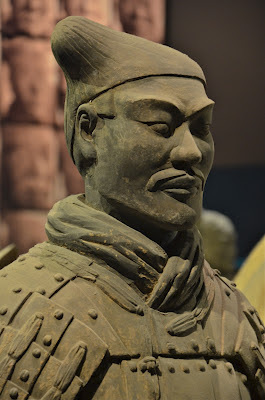 Of course, the major attraction in Xi'an is the Terra Cotta Warriors. More than two millenia ago, a Chinese Emperor used 700,000 slaves, artisans and architects design to build an incredible underground mausoleum complete with a mercury river and booby-trapped entrances. To guard his elegant afterlife palace he had an army of life-sized soldiers, horses, and officers made out of clay and buried in formation. Every single one of the 1,700-plus pieces has a unique face. Until the 1970's, no one knew the clay army even existed since the emperor had anyone who worked on them killed. The government is still excavating and expect the full excavation project to take almost 200 years. I love that after they repair the excavated warriors, they put them back in the pits, in formation. It really puts the grandeur of the army into perspective. Aside from Disney's Mulan and an Ancient China unit I had in 6th grade geography, I came to China almost entirely ignorant of its dynamic heritage and history. It's amazing to me that these people were sophisticated enough to undertake and complete such ornate and lasting projects hundreds of years before Christ. Fabio and I smiled at each other every time we heard someone say the words "only seven hundred years old." The language part. I increased my Chinese vocabulary by 500% while we were in Xi'an! Before you get really excited, I only knew how to say "thank you" before we got there. Despite my grand intentions of purchasing and completing the Mandarin Rosetta Stone before we left, I only managed to download an app that would say "Where is the bathroom?" for me. Oh well, hope springs eternal. The culture part. We spent an afternoon at the Big Wild Goose Pagoda, which is an ancient temple that people still use today. It was beautiful to watch as people prayed, lit incense, and meditated. I always feel something profoundly sacred when I see people sincerely worship, whatever their religion. While we were there it rained. A lot. To the point that the whole city center was flooded. The solution? Dozens of people with bundles of sticks, of course! 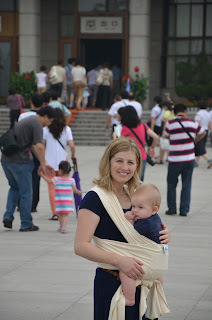 I feel like this picture is such a perfect summary of so much of our experience in China. so swift that they are left with an often awkward struggle between tradition and innovation. According to a friend of ours from Guangzhou, there is a Chinese proverb that roughly translates to, "Fair skin covers a multitude of flaws." When she told us about it, we chuckled, not realizing she was trying to prepare us for the completely overwhelming attention Jonathan and I would receive. Everywhere we went, complete strangers wanted to take a picture with us, a picture with Jonathan, a picture of them holding Jonathan, a picture of their baby or child with us. I am not exaggerating at all when I say that hundreds and hundreds of people took our picture over the course of four days. Some of them were sneaky and took them as they pretended to fiddle with their phone, others walked right up to us and held Jonathan's hand as their friend snapped away. Eventually we started taking pictures of the picture-taking because, well... It. Was. Madness. Okay, to be totally fair I could probably count as one of them. and the Muslim market where we tried sour plum juice and all kinds of Chinese pastries. Living in Singapore, we thought we knew how cautious Chinese people can be about superstitions. But again, China managed to surprise us. Apparently most hotels and hospitals don't have a fourth floor because the word for four is the same as the word for dead and no one will stay on the fourth floor. They would rather change hotels or not go to the hospital. So they just don't have one. The food part. Shaanxi province, where Xi'an is, is apparently famous for their amazing noodles. As they should be. Michael took us to this little local noodle shop just a few blocks from the pagoda. Go there. Go to Xi'an to go there. I have no idea how to say the name of it so just print this picture and give it to your cab driver. And when you get there, order the "four-in-one." Spicy, flavorful yumminess will explode in your mouth while you slurp amazing noodles cooked to perfection. Nope. Not exaggerating at all. Also get the "sweet potatoes" for dessert, which are not sweet potatoes, but potato fries drizzled in caramelized sugar. Mmm. Mmm. Mmm. We loved Xi'an. The food was amazing. The history was impressive. Everyone was so happy, and friendly, and helpful, and kind. I LOVE reading about your trips!! 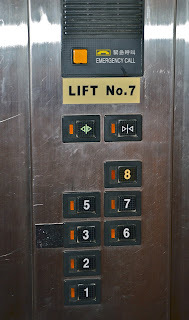 Oh, and did you know, most places in the USA (I think most) don't have a 13th floor? What an awesome adventure you're having! I've never really been that interested in going to the orient, but you've sold me with this post. The food sounds divine! No wonder people wanted to take your picture. What could be cuter than you two with that adorable baby! So glad you are enjoying your time there.